Time for another one of my homemade soap giveaways! This time I am featuring a lemon verbena scented soap, to get everyone in the mood for spring. Technically, spring is right around the corner! How cute are these homemade glycerin soaps? They are a light lemon yellow, and feature a sunflower with the words "Life is Good". There will be two winners. To enter, just click on the Rafflecopter giveaway. I will ship anywhere. Good luck! And stay tuned - in a few weeks, I'll have another soap giveaway, this one for Easter. Readers, do you decorate your home for Spring in any way? What a cheery looking soap, and I love lemon verbena scent! Yes! 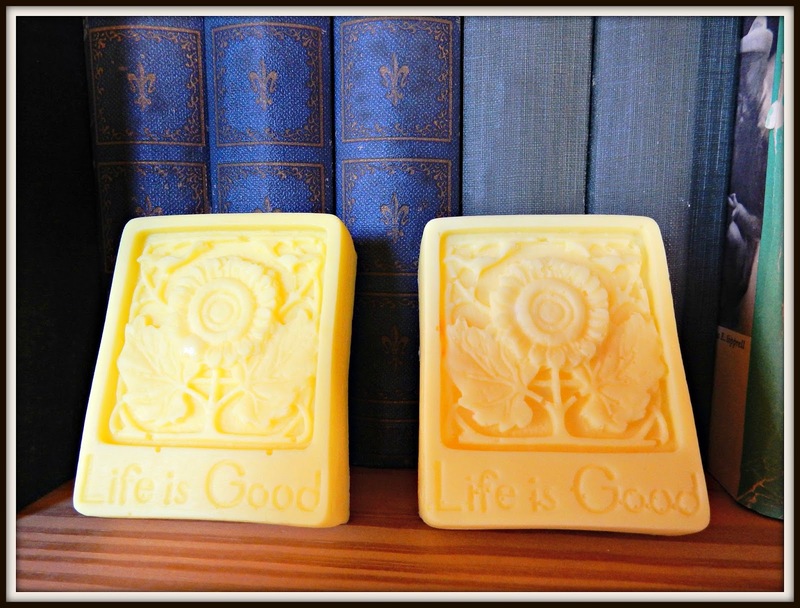 to spring, lemon verbena, and sunshine-y soap! really cute! someone's going to love them. That soap just looks like spring! I don't decorate much. I do have a spring door wreath I can use. How is Pierce? Lemon Verbena is one of my very favorites scents. Those are cute, and yep, I'm def. ready for Spring. Tossed my name in the hat, thanks for hosting! The soap is absolutely gorgeous! I love the yellow, the lemon, and the sunflowers! Wish I could smell through the screen! Whenever I hear about Lemon Verbena I think of Little House on the Prairie. It's Mrs. Bettle's favorite. Of course Mr. Edwards and Laura liked it to. I think I should try to make my own soap. Sounds so interesting. Life is indeed good. I'm digging this soap. tried to enter and couldn't. Thought it was my phone so tried my computer and it still wouldn't load for me. I freshen everything up and change the kitchen linens. I used to wash ALL the walls in the house each spring, but I'm getting too old for that. Now we will just freshen up each room, washing only the walls that need it and hand-washing all the floors and baseboards. I love to Spring clean! Lemon verbena is an unbeatable soap fragrance! Cute mold.